The media library is a place where all the media you have uploaded to Slides can be managed. It allows you to easily reuse content as well as giving you the option to permanently delete it from our server. The library interface automatically appears when you insert a new media element and can also be opened via the editor sidebar. 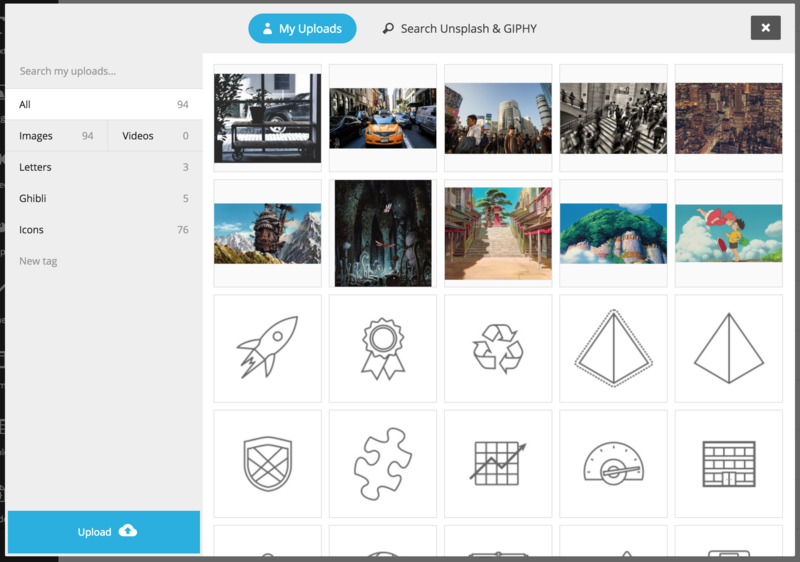 Besides uploading media you can also search for still images and animated GIFs from Unsplash and GIPHY. These images are free to use. Click the Search button in the header to start searching. The search field in the left sidebar can be used to find uploaded assets based on their label. We use the original filename as a label by default but this can be edited by hovering over any media item. Since we default to the filename you can find all assets of a specific type by searching for their file extension, like ".png" or ".svg". We support JPG, PNG, GIF and SVG image uploads as well as all standard video formats. If you have uploaded a lot of media it can get difficult to navigate the library. This is where tags are helpful. Your media can be associated with any number of tags which gives you full flexibility when it comes to grouping content. To create a tag click the "Create tag" button in the left sidebar. The number to the right of the tag name tells you how many assets that are associated with it. To delete an item from the media library start by selecting it. Once selected a toolbar with the option to delete will appear along the bottom of the library. Note that once a media item has been deleted it is permanently removed from our servers and will stop working in any presentation that it's currently used. Multiple assets can be selected at the same time perform batch actions. Once you have selected one or more assets a tray appears in the bottom of the screen with the actions that you can perform. You can also drag and drop the currently selected assets onto a tag to associate them. Advanced: Hold the SHIFT key to select everything between the asset you previously selected asset and the one you click on. If you're part of a team on Slides you have access to a second set of media which is shared among all of your team members. Team media is accessible to everyone in your team but can only be edited by team administrators. Team media can be accessed through a tab in the header of the library.